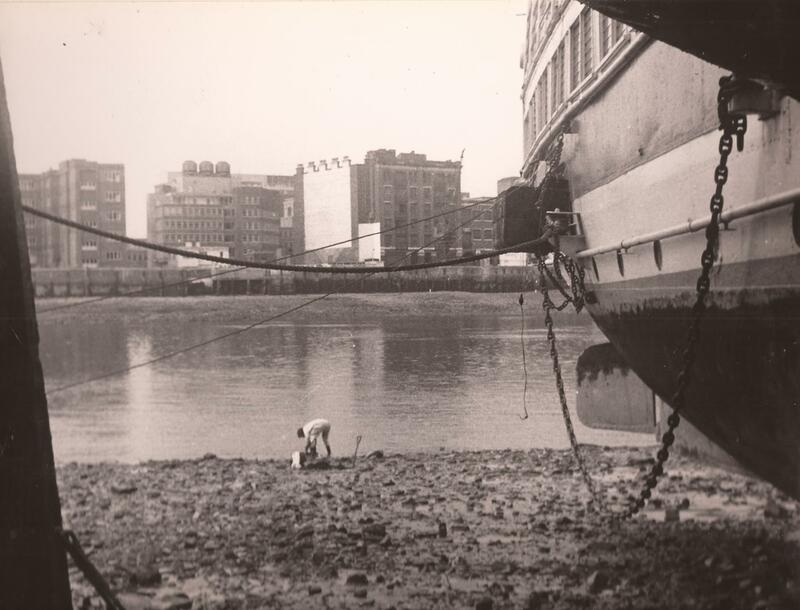 As part of our London’s Lost Waterway Oral History Project we are collecting memories, photos and stories from people who have been visiting the Thames foreshore for 20 years and more. 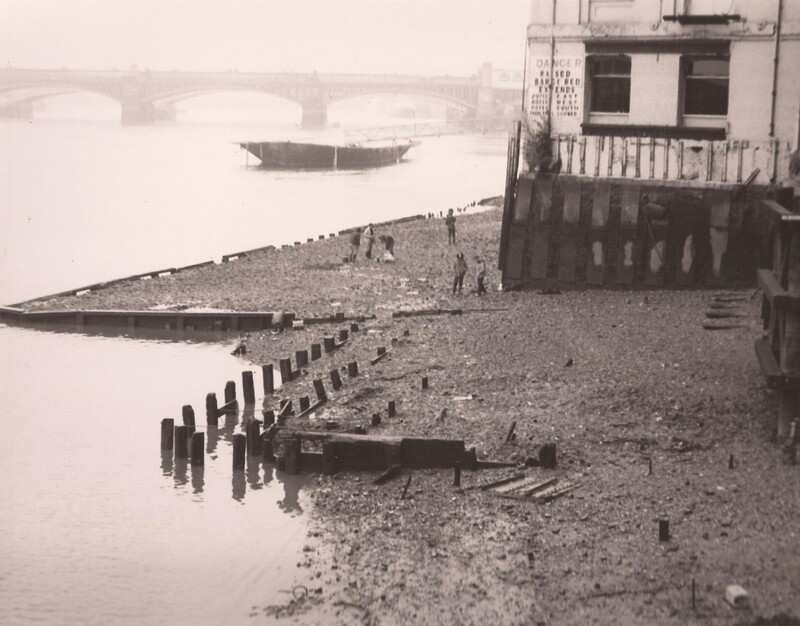 I suppose it must have been in the early fifties when I heard on BBC Radio Children’s hour, a fellow talking of walking the Thames foreshore at low water. As I remember, he said he walked the north bank between Blackfriars Bridge and Southwark Bridge picking up pieces of pottery, clay tobacco pipe stems, bowls and coins etc. Again, I must have stored this information on a high shelf at the back of my mind and there it remained for some eighteen years. In 1966, I started work at the Natural History Museum in the Department of Entomology and a few years later I persuaded a friend of mine to join me on the north back one Sunday morning. I arrived home with a small collection of pottery fragments, handmade pins, clay pipe bowls etc. From then on, I became a Mudlark. Having written to the Port of London Authority for information, I was informed that I was to leave the beach having not left any holes, beware of the incoming tides and avoid mudflats. Those were the ground rules in those days. Those early days were a great pleasure, getting onto the foreshore very early on Sunday mornings from an iron ladder attached to the side of Bull Wharf to watch the sunrise through Tower Bridge. It didn’t take long to strike up friendships with other people down there. The people came from all walks of life: Draughtsman, Plumber, Civil Service Fraud Squad, Entomologist, Shipping Clerk, Park Keeper and others. All these people were fascinated by the history of the river and surprisingly knowledgeable. 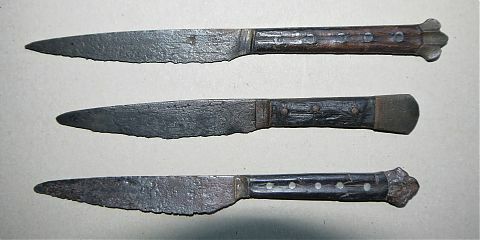 Having found a couple of early knives and keys, it seemed sensible to try to build a collection and it followed that if I found say a coin, I would then swap it for a knife that coin collector had found. Most of the people were in contact with the Museum of London and I remember the Smith brothers (Roger and lan) providing a large number of Pilgrim Badges from the site when Bankside Power Station was converted to the Tate Modern. These featured in Brian Spencer’s book Pilgrim Souvenirs and Secular Badges. Also a large collection of pewter toys and buttons was presented to the Museum of London by Tony Pilson, another of my river friends. 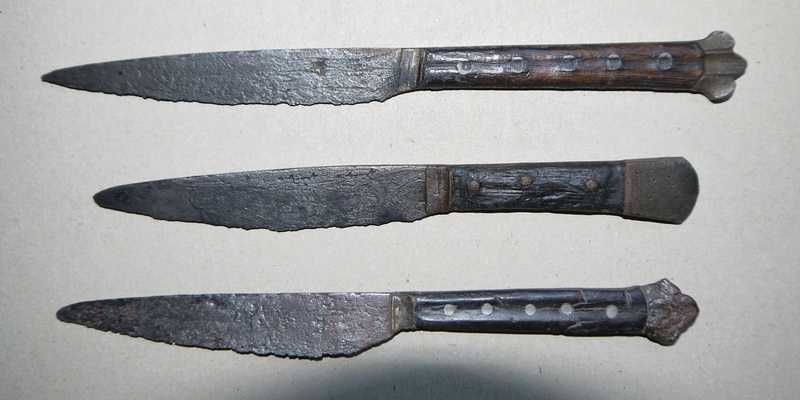 Since I worked at South Kensington, it was but a small walk to Kensington Palace in the Kensington Gardens where I visited the London Museum and Rosemary Weinstein to show her the knives I had acquired. This followed on to the Museum of London where I also had contact with Brian Spencer (Keeper of Medieval Antiquities). I was a regular visitor to the Museum of London. I gave up going to the river in 1986, suppose by then I was getting a little disillusioned the way things were going and the fact that “professional treasure seekers” were appearing and on some occasions there some ugly moments. These people were doing it for money and were in some cases very territorial. 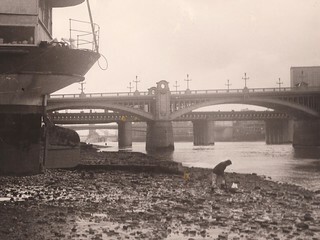 Some would leave large deep holes for the next low water when they would bail out with a bucket on a rope that would allow them to enlarge the search area. By then the atmosphere between the Mudlarks had changed somewhat. I remember the irritation we experienced when a river boat full of tourists would slowly pass us by and the Tannoy on the boat would say “look over to the north bank and see the treasure hunters”. We were happy to find anything that would connect us with the past, a pin, coin or button. Today, a new and very responsible amateur set of mudlarks are at work there. 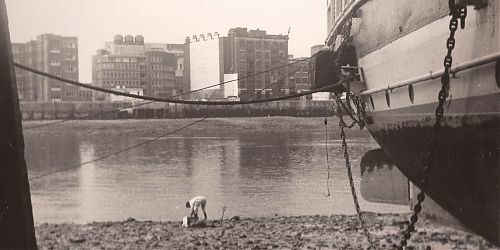 There are several Facebook Groups where people share their finds, including London Mudlark and The River Thames Mudlarking Finds. The ground rules have now changed with a permit system in place, permit holders log their finds with the Portable Antiquities Scheme and are doing an important additional service for the archaeology of London. 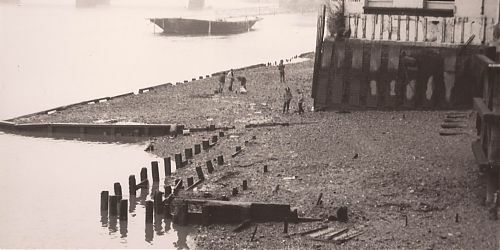 Are you in any of Graham’s pictures, or do you also have memories of the Thames foreshore from this time? We’d love to hear from you!